In Alexander Payne’s new movie, a dainty Easy Bake Oven bell-chime signals the completion of the cellular reduction process. People who were normal-sized adults are now only inches tall, gently lifted off their beds with implements that look like spatulas. The moment is both cute and terrifying at the same time, much like Downsizing itself. Downsizing concerns itself—in large and small ways—with looking at the sacrifices humans make in the name of sustainable existence. 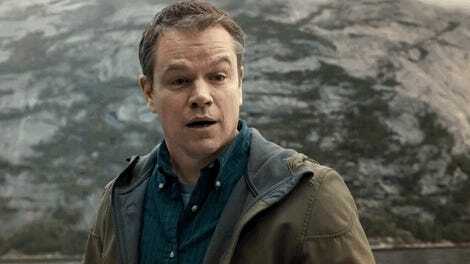 Its main character is Paul Safranek (Matt Damon), an occupational therapist who continues to live in the house he grew up even after he gets married. He and wife Audrey (Kristen Wiig) just can’t pool enough money to live the life of their dreams. Just when it seems like they’ll be stuck in one social strata forever, they have a fateful high-school reunion encounter with friend Dave Johnson (Jason Sudekis), who’s undergone the procedure called downsizing. The Safraneks listen raptly as Dave tells them how shrinking down to the size of an action figure has exponentially improved his life. Won over by his testimonial, the couple decide they’re going to take the plunge and get small. The movie’s first third brims with clever extrapolations of how the titular super-science would change lives, attitudes, and policies. Created as a way to alleviate humanity’s environmental impact, minimization, as it is also called, winds up creating new industries and negatively affecting the bottom lines of old ones. It also gets used as punishment in harsher regimes, as in the case of Vietnamese environmental activist Ngoc Lan Tran (Hong Chau). When she and other dissidents protested the erasure of their village to make way for a dam, they got shrunk down and jailed. (An escape inside a TV box brings her to the United States.) A news report about national security ramifications of minimization gets a drunk in a bar ranting that small people are costing the country money and jobs. He also says that their votes should only count for a quarter of a big-person vote and you’re given the sense that this technology has created sociocultural fissures like all that have come before. Despite all this, the financial asset adjustment that would make them millionaires and a federal tax break lure Paul and Audrey into signing up for smallification. Men and women get minimized in separate lab facilities and Downsizing’s first big twist comes with the phone call Paul gets after he wakes up: a tearful Audrey tells her husband that she just couldn’t go through with the process. Paul then settles into the Stepford-esque master-plan community of Leisureland all by himself, slouching through a boring customer-service call center job and awkward dates with other middle-aged singles. Eventually, Ngoc Lan, who’s since relocated to Leisureland herself, meets cute with Paul while cleaning a neighbor’s house, and the two start spending time together after Paul finds out where and how the small-people have-nots eke out their existences. When it’s revealed that downsizing hasn’t helped planet Earth as much as hoped, Paul has to decide whether to go through with another radical science-fiction life-change. Gulliver’s Travels-style sight gags and situational humor do a lot to buoy up Downsizing’s inherent glum premise. The fact that birds and insects can now eat the species that despoiled the planet provides a dry irony, and I guffawed when a nurse hefted a so-big packet of Saltines into the room as Paul’s post-procedure snack. James Van Der Beek cameos as a high-school classmate turned smarmy doctor and Neil Patrick Harris has a hilarious turn as a Home Shopping Network pitchman for Leisureland. Christoph Waltz steals every scene he’s in as Dusan, an opportunistic Euro-trash businessman who makes money on shadily re-apportioning luxury goods for the small-folk market. Some of the other characters and beats lean hard of broad humor, too, but Downsizing largely comes across as a wryly, self-aware movie that slips in messages about the harm done in the Anthropocene Era. However, that doesn’t negate the film’s most grating element, which is the speech pattern given to Ngoc Lan. She speaks in an argot straight out of Vietnam War flicks like Platoon or Full Metal Jacket, saddled with a willful, brusque affect meant to represent a yawning cultural divide. While one can hand-wave this scripting choice away with the excuse that she immigrated as an adult, it feels even worse coupled with the fortune-cookie inspirational wisdom the character offers. I find myself wondering how the heck a movie that had such earnest, well-thought-out science-fiction elements could land on such a retrograde characterization. There’s not enough there to make it seem like Ngoc Lan’s dialogue and character arc are meant to satirize Orientalist, “Asian person saves white person’s soul” storylines. I liked the character’s brand of bossy empathy but hated how she reminded me of terrible old stereotypes. Watching Downsizing will give some audiences déjà vu, because it invokes the seductive tech-utopia promises of how Segways, smartphones, or battery-powered automated homes will make everything better. The eco-messaging themes play tug-of-war with self-discovery beats doled out to Paul’s existential angst. He wants to do right by himself, others, and the planet but just can’t decide how. Before its predictable climax, one character observes that humankind’s environmental sins will result in an extinction-level reboot of the species. But no amount of wondrous technology will stop humans from being flawed, selfish, and delusional. Downsizing’s ultimate takeaway—a little too cute to offer much bite—is that only we can do that. Downsizing comes out this Christmas.